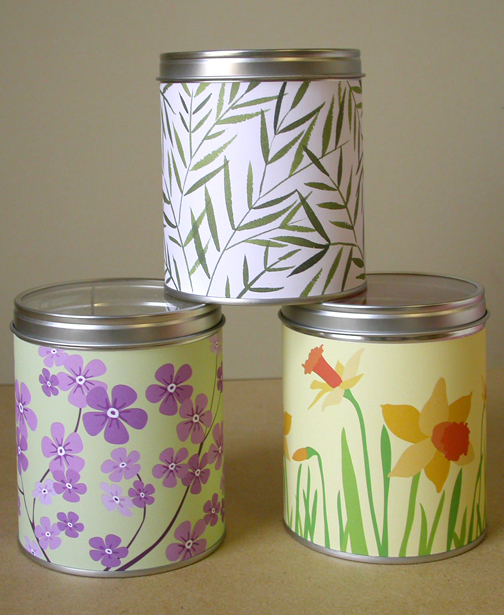 A few years ago, I had a licensing contract with Aunt Sadie's, a candle maker in Boston's South End. As anyone who does commercial printing will tell you, you get a better price on the printing if you print a larger quantity (1000 pieces or over). Well, the licensing contract has come and gone, labels were bought and sold, and at the end of it all, I was sitting on several thousand overprints. In addition, one of my printers mysteriously sent me an extra 4000 labels out of the blue. One option was to chuck them into the recycling bin and call it a wash. But here's the thing: I'm practically phobic about throwing out printing I've already paid for. My mind was whirring for days until I struck on an idea: what if I lopped off the candle label info printed on one end of the label and folded it in half? Lo an behold, it actually fits in an A-4 envelope! I decided to pay the nominal fee to trim all my labels and have them folded. I found myself with a a text weight note with a wrap-around design that is visible through a vellum envelope. 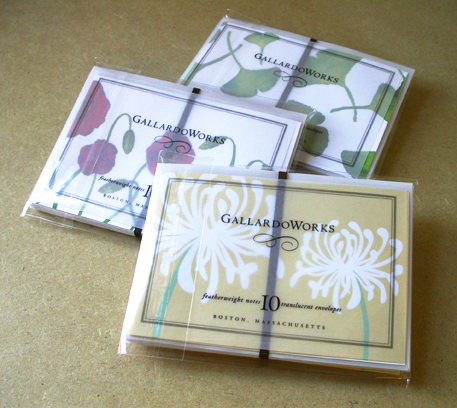 I designed and packaging labels on vellum so the consumer could see the see-through effect for themselves without opening the package. Having worked in advertising and marketing for nearly two decades, I knew that naming this new product was going to be important. I wanted a poetic-sounding name that was also a good description. When I was a kid I used to watch boxing matches on TV with my dad and was fascinated with the weight classifications: heavyweight, welterweight... featherweight. Yes, Featherweight Notes! Light as a -- well, you get the idea. I believe products deserve a second chance, a second life. See my Featherweight Notes at my Etsy Shop. I took this photo whilst in a cab going down west 55th Street toward 11th Avenue. I was struck by this street vendor's display. Nothing fancy, just lining up the goods and letting the merchandise sell itself. 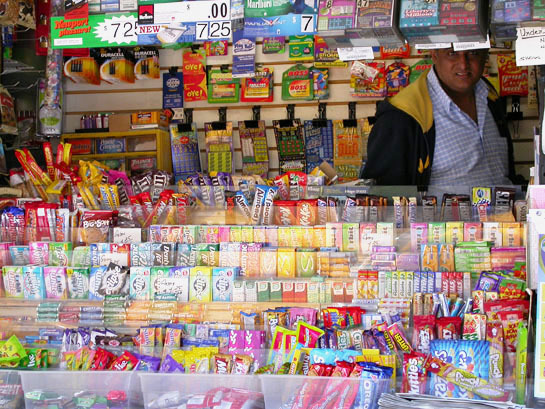 One of the great things about New York City is its vibrant street life. Whether it's Nigerians selling purses or Armenians hawking hotdogs, there's no lack of things to see just walking down the street. I wish I had more time to take pictures but I was a little wrapped up in getting my stuff ready for the Stationery Show. 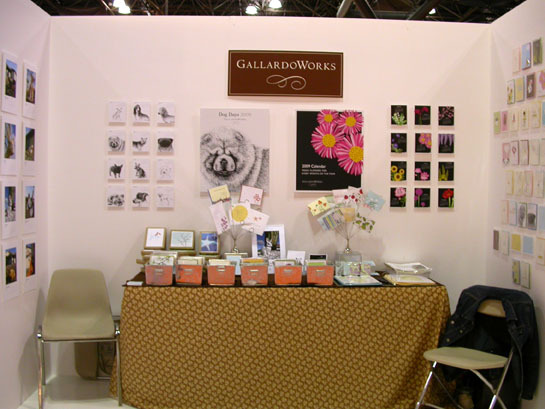 Here's my booth at the National Stationery Show. I prominently featured my calendars this year. I'm hoping to expand my calendar business moving forward. Overall, I think I had a pretty good show despite the fact that the show itself seemed less attended in comparison to previous years. There were definitely fewer exhibitors -- I'm estimating the show has shrunk by at least 25% since I first attended it as a guest in 2002. I found the pre-show mailings were a big help. My customers came and got to see my new designs. A few of them wrote up orders. Most exciting was getting to meet folks whom with whom I've worked for years over the phone and via email and fax. I'm truly blessed to be working with such wonderful people. I also got to make new contacts -- some new retailers, new businesses and of course, other stationery designers like Liz Hutcheson of Fast Snail, Hope Wallace of Paper Relics and Leslie Saito of The Paper Princess. Being in a 4-day show is like being in a lifeboat with other survivors from a shipwreck. You're all waiting for a retail ship to come and rescue you. In the meantime, you keep each other's spirits up and hope for the best. I noticed our particular section was a little slow in terms of traffic -- I'm guessing because our booths were off toward the back. If there's anything I wish I'd done differently, I wish I had submitted my application earlier. I suspect the better spots go to folks who are first in line. Just speculating. I got a lot of help pulling the booth together and manning the show. My sister, Effie, graciously helped me set up the booth and helped me entertain visitors. John also helped me man the booth and was quite the scouter of other booths I should visit. I tend to get tunnel-visioned during the show and it's hard for me to concentrate on anything that's not about getting an order. I want to thank my cousin Jeanne who is so generous in letting us stay at her apartment for the duration of the show. That's approximately $1500 I didn't have to spend on lodging in New York. Thanks, Jeanne! I also want to thank Tony for manning the GallardoWorks studio in Boston. He entertained visitors, made change, promoted my work and encouraged folks to come back in September for the next Open Studios. He is a real treasure! Right now, my studio looks clean and organized but I know better. I basically dumped everything in bins and hid the bins under tables and shelves. There will be a day of reckoning -- possibly this weekend. If my posting seems infrequent of late, it's because of this behemoth event called the National Stationery Show that is bearing down on me and the rest of the greeting card industry like a freight train. If it was only about exhibiting (selling) new products it wouldn't be so bad. But there's a ton of things that need to get done to get ready for the show. It's practically a full-time job. 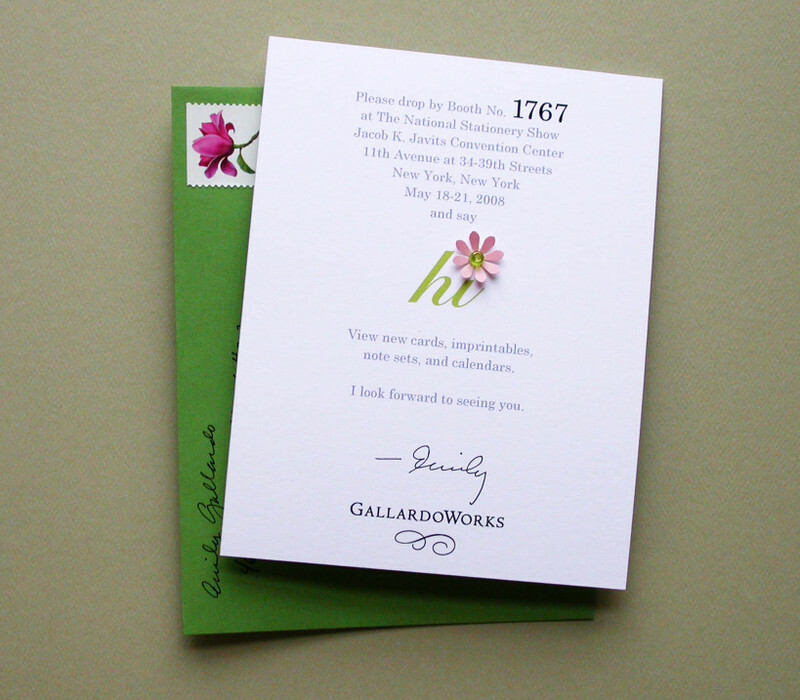 In addition to creating new product offerings, there's pre-show marketing, booth design, website design -- all of that on top of the day to day running of my card and calligraphy business. Yeah, it's a little crazy here in the studio these days. Oh, did I mention that the SoWa Art Walk is overlapping with the Show? My studio space will be open for the SoWa Art Walk and my assistant will be manning headquarters while I try to write up more business in New York. So instead of leaving a trail of papers and beads behind me in Boston, I actually have to leave my studio in an exhibit-able condition. This week I started sending out invitations for reps, retailers and press to come and visit my booth. I wanted an invitation that was a preview to the work I'll be exhibiting and I also wanted to capitalize on the core strength of my designs which is elegance combined with a sense of fun. In addition to an intriguing invitation, I also decided to hand address all the envelopes. It's time-consuming but I'm hoping all the extra labor will result in a much higher "open rate" (as opposed to going directly from the mailbox to the recycling bin), which I'm hoping will translate into a visit and finally a sale. I think getting people to open their unsolicited mail is probably one of the toughest things to do in direct mail. I'm hoping that my audience will get a kick out of getting such an invitation in the mail that it will pre-dispose them into thinking this is something they should get for their customers. 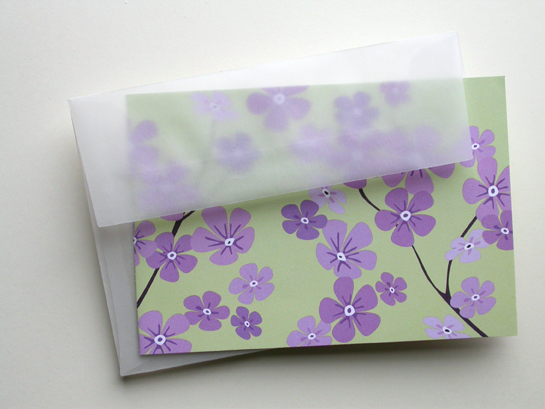 As a final touch I also purchased postage to match the envelope and invitation. 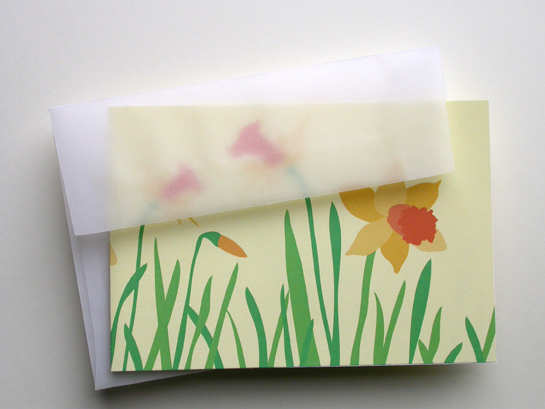 I'm really pleased with these flower stamps -- the images are simple and stunning. They are just the right accent on my apple green envelope. 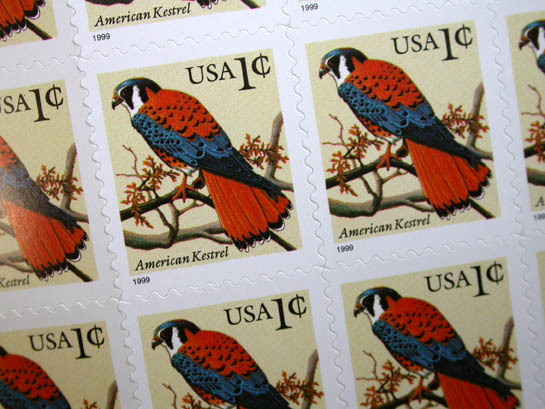 The postal clerk was trying to sell me "Forever" stamps since the price of stamps is going up shortly (May 12). I held fast to my stamp selection because all my invitations have to go out next week anyway. 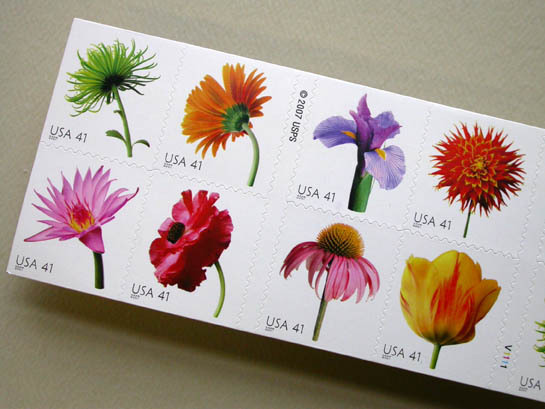 However, I might buy even more of these flower stamps because they are so beautiful and even with a one cent stamp (which has a nice illustration of an American kestrel) they still make a nice envelope presentation. I hope I haven't over-thought this mailer. I just wanted to send something out that wasn't just information with a dash of hype. I wanted to send something out that was personal and meaningful, something that is a part of me.